Well, you might remember me talking about the Christmas present I was making for the wife. I hate to say it, but it didn’t go over so well. I bought a nice wooden frame ($15) and got it printed out at Kinkos ($30) and took it home with me last night. She’s already given me my presents for Christmas, so I thought I would go ahead and give it to her. She thought it was weird… She says it kind of creeps her out. That will teach me to try and make any more presents. At least though, I didn’t spend a couple hundred dollars on it. The last couple of years since I’ve been out of college, my Christmas expenses have been tremendous. Last year I think I spent around $1,500 by the time it was all said and done. This year will be different. The biggest expense we’re cutting out is presents. Yes, we are still giving just about everyone in our family a present, but it won’t be a costly one. Since we just had our wedding, most of the family will be getting a picture from the event. Others will get some pre-made soup jars, and the little ones get a bag with candy and an inexpensive gift. I do have to admit though, the wife did most of this as I hobbled around saying “Bah Humbug!”. Usually though, the most expensive gift I buy is for the wife. This year I’m going to be keeping it around $50, which is a lot less than last year (jewelry). Since I know she won’t be reading this (I’m the only one who does…) I guess I can share what I’m doing. First, she is getting a book about photography. Before she decided to go back to school, we were contemplating getting a digital SLR camera. She hasn’t ever taken any photography classes, so I figured she would like to read about it and decide if it is still something she thinks she could get in to. This is instead of buying the camera first and chancing it ending up sitting in the closet, which is what we might have done previously. The second thing I am giving her is a picture. 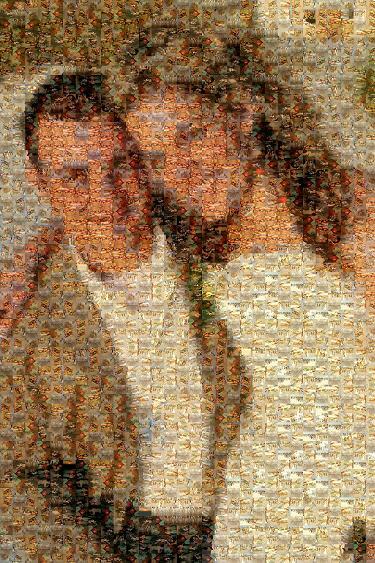 Actually, I am taking all the pictures from our wedding and creating a mosaic out of them that will end up resembling the signature picture from our wedding. It should turn out pretty well, and hopefully I can have it printed at Kinkos for pretty cheap and throw it into a frame from wal-mart. As I was writing this, I realized that it will be fun to look back on this and see how it turned out. I wonder if she will appreciate the picture I’m making, or if she’ll be interested at all in photography. PS: Today is my birthday. 26 years young.